From left, Woodie (clerk), Assistant Manager Myrle Gilette, Bernie (clerk) and C.L. 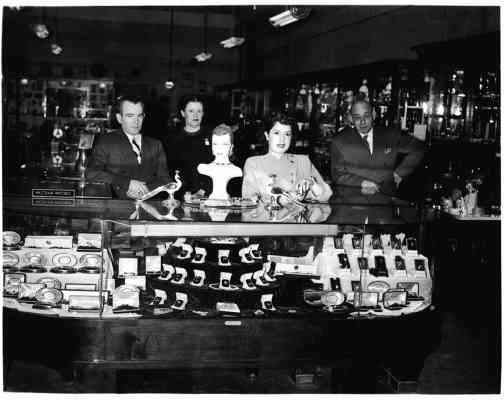 Taylor, the owner, are seen in this 1943 photo at Taylor-Raymond Jewelers. Taylor-Raymond celebrated its 95th anniversary in 2008. The traditional gift for a 95th anniversary is diamonds and rubies. So somehow it seems appropriate that Taylor-Raymond Jewelers sold a treasure chest of jewelry on its 95th anniversary in 2008 and donated a percentage of its sales to the new Breast Care Center at Mercy Regional Medical Center. The anniversary kicked off with a cornucopia of appetizers catered by Guido's Favorite Foods Italian Market and visits by members of the Victorian Aid Society on Dec. 11, also known as Noel Night. The event garnered the "perfect crush" accolade for a party. A number of representatives from internationally known jewelry designers including Martin Flyer, D'Annunzio, Tycoon, Andrew Meyer Designs and Charles Krypell flew in for the party. Many of them unveiled one-of-a-kind designs and jewelry to be sold via silent auction for the cause. A limited-edition, customized dragonfly pin and necklace were also available. The dragonfly, which is a messenger bringing wisdom, peace and happiness in Native American mythology, is the official symbol of the Yes Ma'am campaign, which is raising funds for the center. From then through Christmas Eve, men treated the women in their lives (and many smart women treated themselves) guilt-free, knowing their purchase will help save women's lives. Taylor-Raymond was founded in 1913 by, you guessed it, gentlemen named Taylor and Raymond. C.L. Taylor bought out his partner in 1943, and continued to own the store until 1962, when Mac and Nina McCarty took it over. Bob and Gloria Estes purchased Taylor-Raymond in 1982, and their son Bobby Estes, along with his wife, Marilyn, made it their own in 1999. So while the history may go back 95 years, the business has really only belonged to a few owners. One thing has remained the same. Whoever had proprietary status over those nine-plus decades, they were generous to the community. Bobby Estes says the staff is just like family, and no one calls it work. They just enjoy being around people who are making a joyful selection. Taylor-Raymond's two-month long anniversary celebration will continue until early February. And although Bobby Estes doesn't yet have a total for what the donation will be, he says it will make a difference. Christmas Eve's sales were the best in the history of the store. Celebrating the first of 2009's birthdays are Ellen Williamson, Sandy Campbell, Gay Kiene, Ilamae Watters, Michael Davidson, Betty Brittain, Beverly Herath, Dottie Johnson, Jamie Pratt, Ted Carr, Jon Geer, Michele Jackson, Kellie Stanley, Justin McBrayer, Casey Lee Fishbach, Danah Barlow, Richard Biegel, Kathy Redford, Paul Robison, John Ugai and Melissa Campano. This year, Carroll "Dr. Pete" and Maxine Peterson invited me once again to their Christmas singing party Dec. 20. Just walking up to their beautifully decorated Victorian on East Third Avenue puts partygoers into a festive mood. The event is a wonderful combination of family, his barbershop quartet, First Class Delivery, and a few folks like me who just love holiday music. The hostess apparently spends much of her December baking for holiday parties, including numerous delicious breads - the Swedish limpa bread is a recipe inherited from Dr. Pete's mother - deli meats and cheeses and fruits. Of course, no Scandinavian smorgasbord would be complete without Swedish meatballs. Maxine Peterson is also famous for her hot spiced cider, and this year's batch reinforced her reputation. After the group sang for an hour or two, there was a break for more food, including a variety of cookies, fudge, cake and other goodies. Then there was another round of singing, ending on "Silent Night" sung in a room lit only by Christmas lights. Then we went back into one of the longest nights of the year, with a glow in our hearts and a song in the air. In the Wednesday Neighbors column, I wrote about those at the La Plata County Sheriff's Office who had been honored at the department's Dec. 18 luncheon. I was missing three of those recognized. Three members of the La Plata County Detentions Division received the Badge of Merit for how quickly they discovered a suicide attempt and summoned medical aid at the La Plata County Jail. They saved the prisoner's life. They are Zach Farnam, Garrett Valencia and Aric Kittle. Kudos for doing an important job with care, concern and intelligence. My thanks to LPCSO spokesman Dan Bender for getting the information to me. Because this is the first Neighbors column on 2009, it seems like the right time for the party queen of Durango to muse on etiquette. We're quite relaxed here when it comes to dress and manners, but there are some areas where we should step up to the plate when it comes to etiquette. More than once I have encouraged my friends and neighbors to RSVP to invitations. Why? Because it's just plain rude not to give a host or hostess a reliable count before a party. It lowers the stress levels of the hosts, and when the hosts are happy, the guests have a better time. The only good excuses for not attending after RSVPing "yes" are illness, weather or, sometimes, work. If those things happen, give the hostess a call as soon as possible. The only acceptable reasons to show up after RSVPing "no?" There aren't many, and it's never OK without checking in with the hosts first. Another good etiquette point - buy tickets early to fundraisers. If one of the reasons you are going is to support a favorite charity, then you want it to make as much money as possible. If it has to overbuy on the food and liquor front, that's money that it won't have for the cause. If a charity underbuys, it gets a reputation for stingy parties, finding it difficult to sell tickets the next year. Then there are the Durango-centric etiquette dilemmas. The Herald newsroom recently got a call from a new-to-Durango hostess who had given her first dinner party here and was upset about local manners. Her first complaint was that guests didn't bring a gift to the hosts. My response on that front is that if a gift is a requirement to attend a party at her home, she's going to have low attendance. While it's very thoughtful to bring or send a gift, it should be considered nice to receive, but not rude if a guest comes without. My philosophy is that an invitation is a request that you show up and add your sparkling personality to the gathering. Period. The newbie also was surprised that a couple or two showed up with their children and/or dogs in tow. In a child- and dog-friendly town like Durango, that's not as rude as it might be somewhere else. If you want your party to be adults-only, or if you're not comfortable having someone else's dogs at your house, specify it graciously in the invitation. Durango is a fantastic place to live with a wide variety of interesting and fun characters. For some people, we're just a little too laid back. There are plenty of places to live where the more formal is the norm. We won't take it personally if Durango just doesn't work for your style. Notching another year on the anniversary calendar are Walt Balfour and Bonnie Keefe, Tom and Lisa Breed, Jon Powell and Linda Arndt, Bob Vialpondo and Dian Jenkins, Bill and Carol Thurman and Jerry and Anke Leadabrand. Here's how to reach me: neighbors@durangoherald.com; phone 375-4584; fax 259-5011; mail items to the Herald; or drop them off at the front desk. Please include contact names and phone numbers for all items.